After months of mystery, Dino Dini's "Kick Off 3" was finally unveiled. Unlike the second instalment which was effectively tweaks and improvements to the original's codebase, this one was re-coded from the ground up. Would it be able to take back the crown from "Sensible Soccer" ? Speaking of which, the Sensi lads hadn't been resting on their laurels and "Sensible Soccer v1.1" was due out next month. Player and club data had been updated for the new season, and there were other welcome changes such as re-written goalie behaviour. 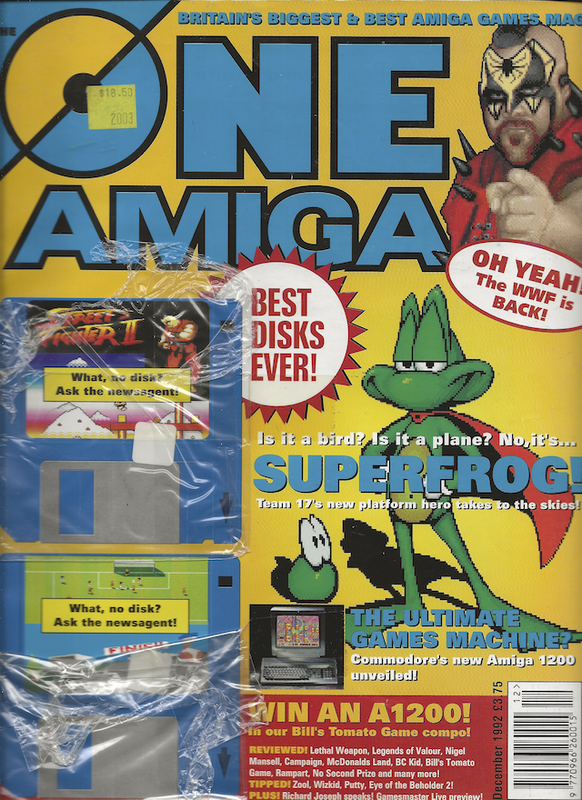 The biggest arcade game on the planet was getting an Amiga release. Creative Materials was in charge of the "Street Fighter 2" Amiga port and the screens they released looked promising. Could it actually best the SNES version? (of course not - it wasn't terrible, but it wasn't a patch on the SNES). Microprose were working on "Gunship 2000", a follow up to their popular helicopter sim. They also had another flight sim in the works in the form of "B-17 Flying Fortress". Cryo boss Philippe Ulrich swung by The One to discuss "K.G.B." and a "bizarre strategy game" called "Eden" (unreleased). The French developer's previous game was "Dune" (not to be confused with Westwood's outing) and he revealed they were planning CDTV versions of "Dune" and "K.G.B" featuring voice acting and, in the case of "Dune", digitised footage from David Lynch's film adaptation. And funnily enough this month saw Virgin announce "Dune II" (by Westwood), which would quite a different experience than Cryo's. Core Design were having a crack at the console platformer with "Doodlebug". Apparently the game turned up on their doorstep already complete. "Ferrari Grand Prix Challenge" from System 3 promised arcade style F1 racing action (unreleased?). How long had it been since the Amiga 600 launched? 1 month? 2? At any rate, Commodore slashed £100 off the price and reported the machines were in high demand at £299. Rumours continued about the Amiga 800 - could we see a reveal next month? EA's "Road Rash" was heading to the Amiga. "Another World" creators Eric Chahi and Frederic Savoir had signed a deal with Virgin to publish their next game, "Heart of Darkness" (the development of this would become a bit of an epic tale - it would not appear on the Amiga). Titus were launching a budget label, Fox Hits. A rather good Lemmings/Terminator animated intro had been doing the PD circuit which suggested "Lemmings II" wasn't far off. Renegade signed Andrew Braybrook's "Uridium II" and expected it to be out early 1993. The publisher had also picked up the team from defunct Strangeways Software who were now working on a game called "Ruff & Tumble". Meanwhile, "Sensible Soccer" was to get a CDTV version. And finally... The One took some enjoyment to point out a year old quote from Anco "Kick Off" designer and playtester Steve Screech saying that it would be "at least three years before another decent footie game comes out." The One took Westwood president, Brett Sperry, down the pub for a chat. Spoilers galore as Gary Whitta reviewed endings of various games to see whether they were worth the bother. Over two years in the making, The Bitmap Brothers' much hyped next game - "The Chaos Engine" - was almost here, so Gary Whitta paid them a visit. The behind-the-scenes work-in-progress series on "Frontier" drew to a close with its third and final instalment as the game was approaching release. An indepth look at the impressive looking "Legends of Valour" - the Wolf3D-esque raycast renderer has to rate as one of the best seen on the Amiga. 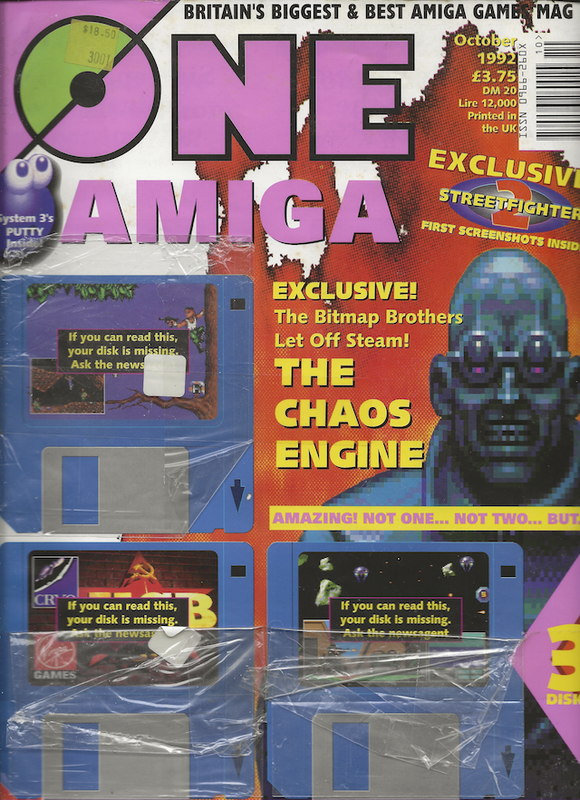 While the game was originally developed on the PC, Novagen's Paul Woakes was responsible for the Amiga engine. In this month's "Uridium 2" dev diary Andrew started tackling the end of level mini-game (which was quite different to how it would eventually turn out), worked on some more weapon types and added the high score entry screen. "Putty" System 3 - 87% "That System 3's programmers have been able to pack so much versatility into Putty yet still make him relatively easy to control is a miracle." "The Humans" Mirage - 80% "The Humans smacks of class and humour. From the groovy animations illustrating key points in the game to the hilarious caveman band that appears on the high-score table, you'll be smiling broadly during play." "Archer Maclean's Pool" Archer Maclean/Virgin - 90% "Pool is a big step in the right direction, basing the same excellent engine and player interface around a green-baize game that is so much more suited to computer simulation [compared to Snooker]." "The Aquatic Games" Millennium - 84% "I think that the Aquatic Games has enough humour and nice touches to warrant a purchase by all but the most sophisticated gamers." "Shuttle" Vektor Grafix/Virgin - 81% "It's a game with much to offer as long as you are prepared to persevere (it really does take some effort) and it's just the job for those long Wintery evenings waiting just around the corner." "Lotus III: The Ultimate Challenge" Magnetic Fields/Gremlin - 86% "At the end of the day, though, Lotus III is a goody. It's more polished and playable than 98% of the competition (for the record it's better than Jaguar, but hasn't quite got the the [sic] edge over the superb Crazy Cars III), has the best soundtrack I've heard in many a month and on the whole fans of the series won't be disappointed." "Fireforce" I.C.E. - 90% "Don't let the graphics put you off - Fireforce is one of the most enjoyable and sophisticated shoot-'em-ups I've played and full marks to I.C.E. for having the bottle to try something with a bit of an edge to it for a change." "Troddlers" Storm - 85% "Initial appearances can be deceiving, though, and on playing it becomes apparent that Troddlers is not as linear as the DMA classic [Lemmings], with varying missions which don't always involve just guiding the Troddlers to the exit." "Zool" Gremlin - 87% "'Fuller' than Robocod, faster than Harlequin and, I think, better than what I've seen of any of the Mario games (although those dratted Nintendo owners will no doubt be up in arms about that)."